Well the animals are all here now, so it’s time to get all the stuff for the farmers markets in order. We’ve got our markets lined up: Zumbrota, Red Wing and Eagan. Now to get the trailer all squared away that we’ll need. 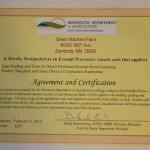 According to the Minnesota Department of Agriculture (MDA) a farmer doesn’t need a license to sell meat from their own animals, as long as 100% of the ingredients come from the farm. They will need to keep the meat in a NSF (commercial) Freezer that’s plugged in at all times. We will be selling meat from our own animals, but we’ll also be selling a few things like bacon and sausage that have a few ingredients that don’t come from our farm, like salt and spices. 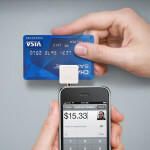 In the MDA’s eyes, this means that we need to have a Mobile Retail Food Handlers Permit. Commercial refrigerator to store the eggs. Generator to run the freezer and refrigerator while we’re on the road. Today I got two of those knocked out. 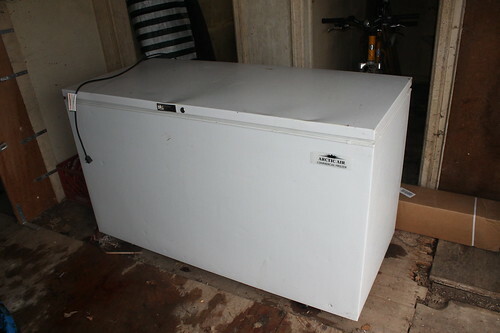 I drove over to Winona and picked up this commercial chest freezer that I found on Craigslist. It’s got a couple of dings, and the casters on the bottom need to be replaced, but it’s clean and most importantly, it works. Commercial chest freezers are actually kinda hard to find. Most restaurant supply places have upright freezers, which in addition to being inefficient, are too tall to fit in a trailer. This particular freezer only draws 5 amps max. That’s 575 watts, which means that you could comfortably run two freezers and a refrigerator on a 2000 watt generator. 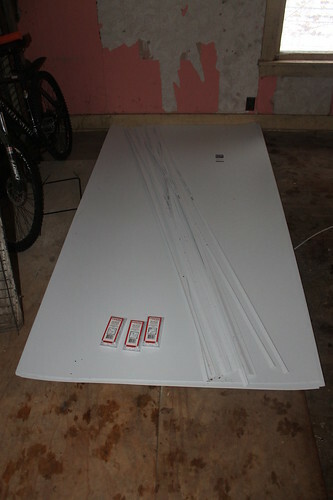 On my way home I stopped by a home improvement store and picked up 7 sheets of FRP, which everyone around here calls Dairyboard, and all the accoutrements that we’ll need to install it in the trailer. 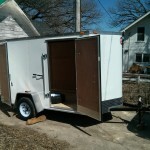 The FRP is required to make the trailer into, essentially, a retail food establishment. As with any restaurant or store that sells food, the walls and floor have to be easily sanitized. Since most trailers have plywood walls, they need to be covered up with FRP to pass muster with the MDA. Anyhow, it’s two down, three to go. We’re on the hunt for a trailer next week, and I’m following a few leads on a refrigerator and generator. It’s a lot to get done in the next month, but we can’t sell much without it.